Today increased uptime to meet production targets and output demands with a reduced number of personnel is an absolute must for operators of conveyor belt systems worldwide. Therefore they all require scrapers that are simple and user-friendly and achieve maximum cleaning efficiency. 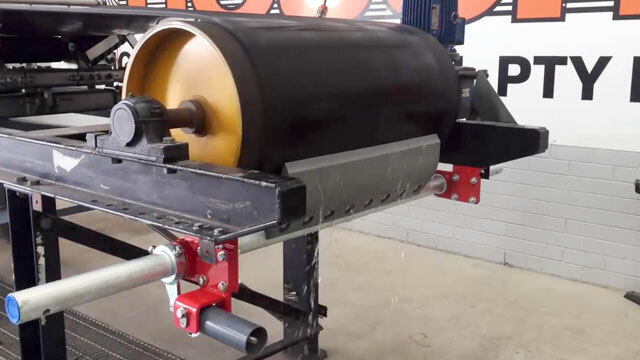 In case the main scraper cannot cope with the thickness of the material sticking to the belt surface, a so-called pre-scraper has to be installed. / High economic efficiency in combination with the HOSCH main scrapers. In combination with the HOSCH main scrapers, which have a worldwide reputation for unsurpassed efficiency, the HOSCH pre-scraper type HD-PU reduces cleaning and operating costs as well as unnecessary downtime.